If you’ve been following me for a while, you know that I am a die hard jewelry lover. Working in a corporate environment and having limitations on ones style & self-expression when it comes to fashion can be tough. I love that jewelry can be used to take an outfit (in my case a boring black suit haha) and make it more stylish. 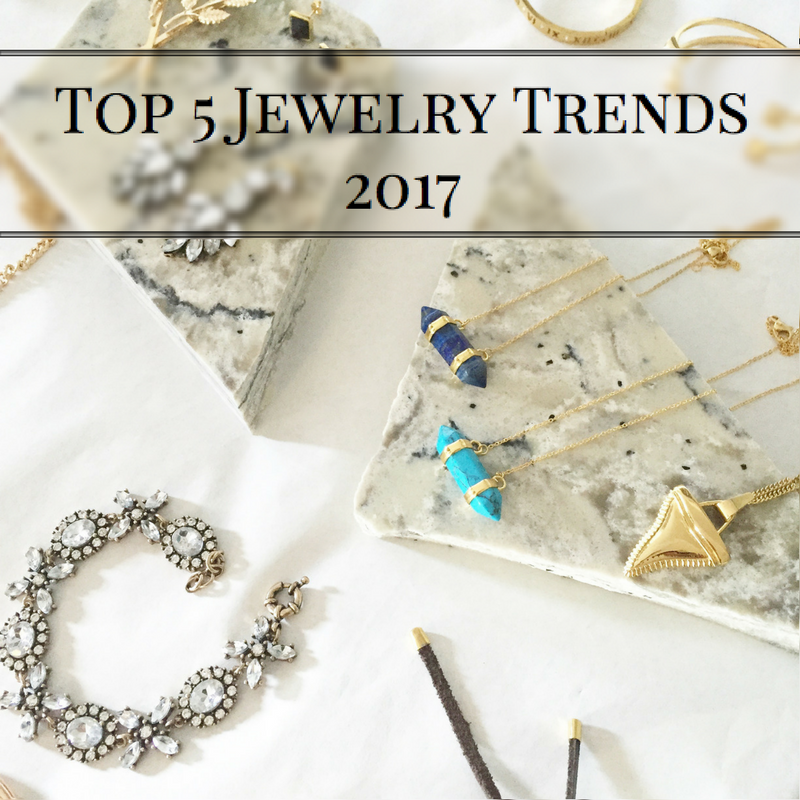 Now that 2017 is well upon us, I wanted to round up the top 5 trends for jewelry for this year. Let’s get to it! One trend that is popular across all jewelry pieces this year (rings, necklaces, earrings) is geometric shapes. The runways were filled with designers from Stella McCartney to Kate Spade showcasing geometric items. Below are some of my current favorites. The victorian era inspired so many designers collections at fashion week this year, and jewelry is no exception to the victorian-themed obsession. Think lace, filigree design & pearls. Below are my favorites. I personally found this to be the most unexpected trend of in jewelry this year; and I love it. The trend, in case the title isn’t clear, is essentially wearing two of the same bracelet- one on each wrist. We’ve seen this trend in years past with large cuff bracelets, but this year it’s popular not only in cuffs but in dainty bracelets as well. Below are my favorites that would like great worn as a ‘set’. It’s no surprise that in our busy, multi-tasking culture that women are turning to jewelry that does more than just sit and look pretty. The most interesting jewelry trend of 2017, in my opinion, is the emergence of ‘functional’ jewelry. For example, Maria Shireen has beautiful looking bracelets that are actually hair elastic holders. This way you can have a hair tie on your wrist without it digging into you, and while adding a piece of beautiful jewelry. Other functional jewelry that is popular this year are watches (they are making a comeback!) & fitbit bracelets. Thank you so much! Glad you found the info helpful! I share your love for jewelry! I want them all but have my eye on geometric jewelry too! Ya girl! jewelry is just the best. I can totally see you rocking some geometric statement necklaces this spring! I can definitely picture you with some geometric bracelets – you are great at creating arm parties! Love the geometric pieces and the functional pieces. The functional are definitely really cool. I love my hair tie bracelet. You know how much I love my jewelry! Definitely looking forward to Victorian inspired pieces. So pretty! Yesss to all of these! I love taking outfits to the next level with a great piece of jewelry 🙂 Great roundup! Thank YOU for reading it! So glad you liked it! Ya Nice article,really i love jewellry ,special pearl jewelry.Recently i purchased one peral ring from Timeless Pearl.Thank you for sharing Nice article. So amazing jewellery trends. These trends are perfect according 2017 trends. I also looking for artificial jewellery wholesalers in india.